To design and install a modern family kitchen, maintaining space for a table and keeping an open feel. Via a set of bi-fold doors the kitchen leads out on to a decked area so maintaining a sense of “flow” was very important. 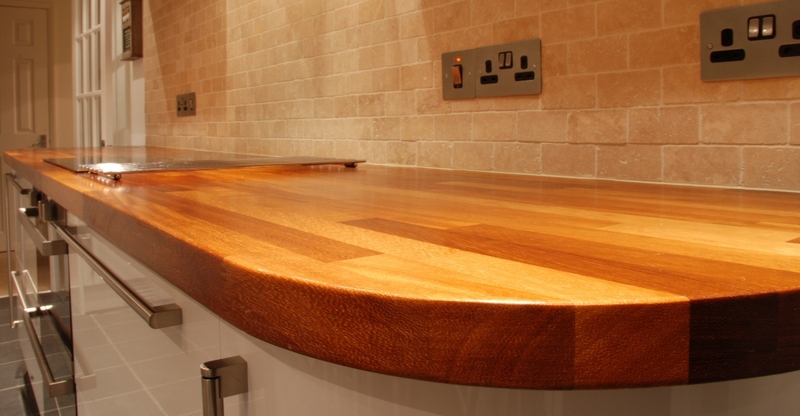 The client wanted a mix of modern furniture and natural materials for the worktops and spashback. 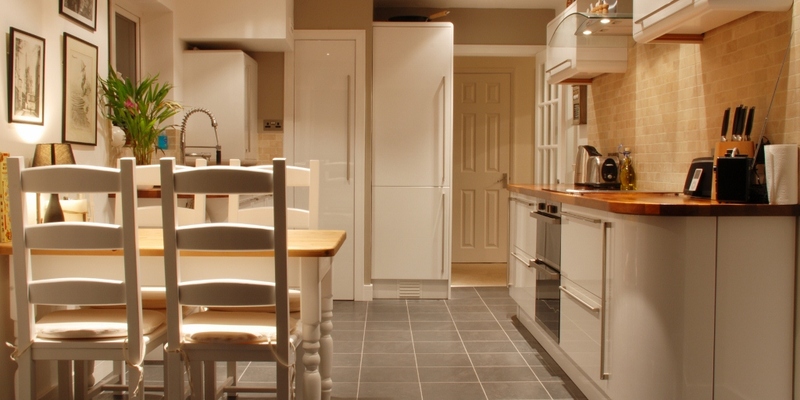 The kitchen also needed to house a built in washing machine and make use of an existing larder cupboard. The decision to keep the table and chairs meant the space available for the kitchen furniture and appliances was fairly limited. With this in mind the design needed considerable thought to accommodate all our clients’ wishes. The sink sits between a built-in washer/dryer and a built-in dishwasher. 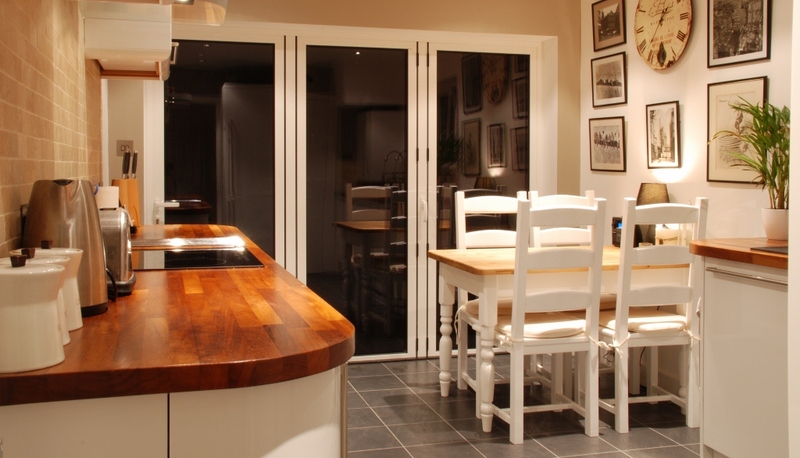 The existing larder cupboard was adapted with the door and mouldings re-clad in matching front material whilst the inside was reconfigured to accommodate the vacuum, ironing board and recycling bins. The feature part of the kitchen is the curved oven/hob run of units, topped with Iroko worktops. 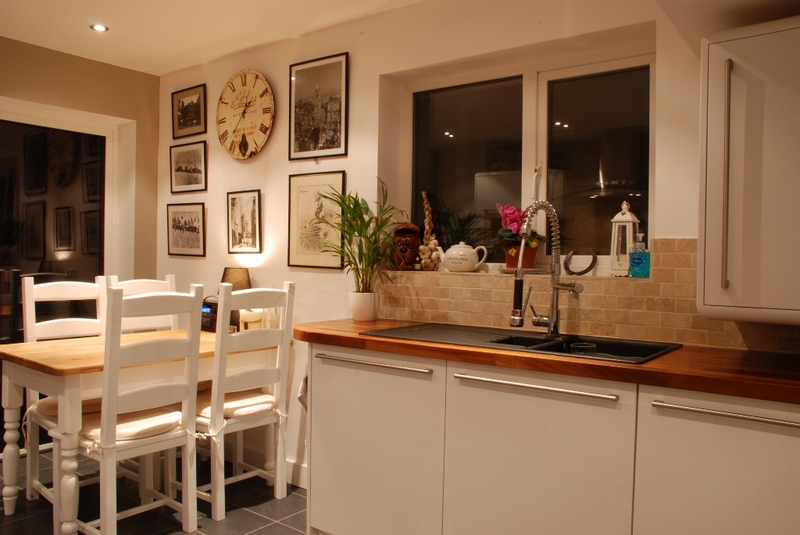 Considering its size this kitchen works very well to provide a highly usable space both for cooking and socialising. The use of curves creates a simple yet striking look whilst the elegant mix of real wood and high gloss lacquer give the kitchen a truly luxurious feel. The warmth of the wood is further enhanced by the travertine tiling, used to great effect to add another layer of texture and interest.